Yesterday's match between Manchester City and Swansea had created many expectations after City's latest loss for the Champions League - and subsequent questioning of Roberto Mancini's tactical and man-management skills. Would the Italian manager persist with the three-man defence or would he heed his players' call? In the end, the Citizens took the three points, but Swansea will probably count themselves unlucky not to get a point. As it turned out, Mancini surprised many a pundit (yours truly included) by leaving his stubbornness aside for once and went with the player favourite 4xx4x2. The first half was basically a stalemate and it often reminded the Premiership of the late 90's - two teams arranged in the same formation sitting in front of each other, waiting for their key players to decide the match. While City came out flat, with hardly any dynamics, movement and creativity, there were no "parked buses" on Swansea's half. 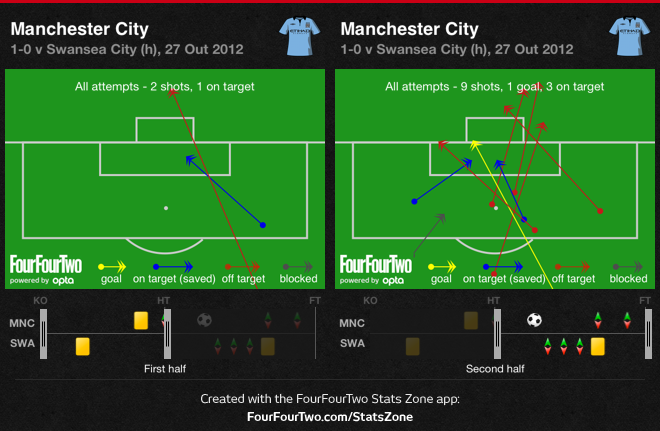 In fact, the Welsh were more than willing to play an open contest, trying to exploit City's vulnerability at the back breaking quickly - which they did fairly well, with Michu putting the ball in the net after a correct call for offside and forcing Joe hart to make a great save a few minutes later. City weren't even making Michael Laudrup's men work for the result. but improved a great deal in the second. often trying to play in Michu behind the centre-backs. Mancini replaced the ineffective Kolarov (even though his poor game was not exclusively his own fault) with Balotelli and the change brought immediate results. While the Italian maverick did not exactly set the match alight, the different tactical arrangement meant Tévez was an extra man in midfield, but it also meant that the front four (Tévez, Balotelli, Agüero and Nasri) were more fluid in their positioning. Outnumbered in midfield, Swansea were no longer able to make as many interceptions as they had done in the first half, allowing City to pile on the pressure. 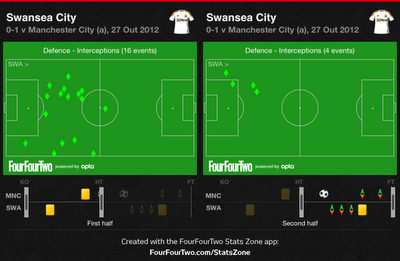 Swansea were excellent in breaking up City's play in the first half. The Welsh were not as good at it during the second half. 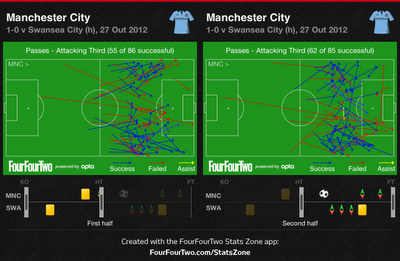 The difference in passes in City's attacking third. While subtle, it shows a greater presence in the centre, mainly thanks to Tévez. The match should have been beyond Swansea's reach by then, but City never managed to dictate the tempo of the game (despite all of Touré's attempts) and finished the match with unnecessary suffering and going back to the three-man defence, this time trying to hold on to the result. Swansea were worthy adversaries; it's always refreshing to see a mid-table team resisting the temptation of playing route one football and insisting on playing out from the back, even when trailing - it most likely means their manager's ideas are coming across nicely and are being accepted by the players. As for City, the much-needed win can't hide the team's persisting problems and shouldn't allow players and coaches to believe the worst is behind them. On most matches, the start players will suffice, but harder opponents will not be as kind. Carlos Tévez was absolutely critical for the victory - and his scoring the winning goal was only fitting. His movement, work rate and bravery were essential for his team to grab the win. This may well be turn out the Argentinean's best season in England. Wayne Routledge showed an interesting skill set and often provided his team's out-ball. His wonderful trickery with the ball made him a safe bet for his team to break out from City's initial pressure zone, hugging the touchline and forcing City to spread out to deal with him. 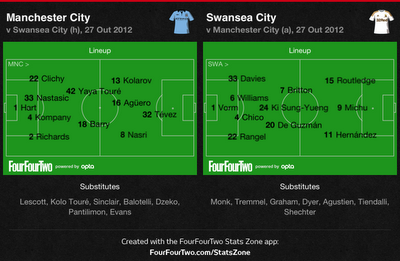 Routledge was often the men Swansea looked for to escape City's pressure.